Photo published by the Anaklia organizing group. TBILISI, DFWatch–The Republic of KaZantip, until now residing in Crimea, seems to be experiencing its own share of separatism, but it’s hard to figure out who is breaking away from whom. Perhaps it is more fitting to call the music festival uprooted than splintering off, as the main organizers – at least according to themselves – have moved the event to another country. As such, they can hardly be called the separatists, as they are the founders. It was after Russia’s annexation of Crimea that the split happened. The group inviting festival-goers to Georgian Black Sea resort Anaklia in August say they in fact are not only founders, but the entire organizing group, so that’s it. Anyone else claiming to represent KaZantip would be an impostor, then. But in May, Itar-Tass reported on another group who claimed to be the real organizers, proclaiming that the festival had not been moved to Georgia after all. They even have their own web page under the Russian .ru domain, which contains almost exactly the same information as the Georgian-based one, and the new head of the Crimean government Sergei Aksenov has even given them his stamp of approval, as long as there are no drugs involved. So where should an electronic music lover go? What’s the difference between the two? They both portray themselves as low cost, friendly and true to the festival’s spirit. 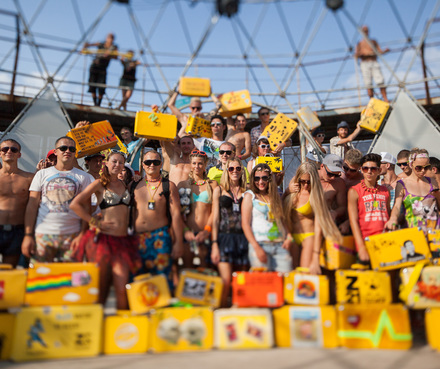 According to breakaway Anaklia, KaZantip has a form of a republic and every person, wishing to get in must receive ‘visa’ instead of ticket to attend the ten-day festival. The territory of the festival has borders and inside it has infrastructure like a real settlement, with camping, restaurant, hotels, yard and other places, with of course stages for the music, which plays 24 hours a day. Breakaway Crimea describe the concept in much the same way. They write that KaZantip is a close territory of 100,000 square meters at the coast of Black Sea in Crimea with clubs, bars, lounges and restaurants. The rules and traditions explained on the website are also almost the same. But Nikita Marshunok, a businessman who is a president of KaZantip, has some words of warning in store for those who are about to book a ticket for Crimea. The whole festival might in fact be a scam, because all the people who have created and been organizing KaZantip have left Crimea, and he has no idea who the other organizers are, who furthermore appear anonymously without saying their names. Marshunok says it was hard for people to attend the festival when it was held in Popovla, in Crimea, because of ‘cosmic prices’ and the quality wasn’t adequate for the prices. He advised the Popovla group not to copy what other people do, but organize something original. His own group’s website now has a map of Anaklia, which shows all the features of the republic with marked hotels, games, squares, stages, islands and other features on it. He continued that it will be able to live for free at the camping part of the breakaway KaZantip republic. But in Crimea where the republic first set roots, local online newspaper an-crimea.ru quoted head of the local administration Alexander Abramenko saying that on the crest of the KaZantip wave, and its brand’s popularity, people can take advantage of the situation to earn some money, which will last a year, or maximum two. Perhaps disappointingly for the anonymous Popovla team, he added that in 2014 there really might be some festival in Crimea, but it won’t be KaZantip. But Popovla splinter group insists it will happen and say provocations and innuendo have been haunting KaZantip festival almost every year.